With the phoney war seemingly coming to an end I've been beavering (or should that be sabling?) away on some units of imaginations infantry for my genial protagonist buddy Evan. The first of two regiments is near complete and requires only basing and flags (which I've already designed). 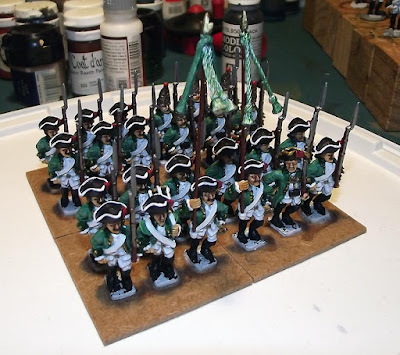 The second regiment is also coming along nicely and is really just awaiting buttons, bows and accoutrements to reach completion. Flags are ready to go for this unit too. I'll easily have this finished by the weekend and can base both up together. In other news a small commission and a steadily sinking GBP has enabled me to go on a spending spree on fleaBay / AbeBooks and add a further NINE tomes to the steadily growing classic wargames book collection. I'm particularly keen to finally get my hands on Charles Grant's Ancient Battles for Wargamers and The Battle of Fontenoy. More on that as they arrive in the post of the next few weeks or so. Michael, I snagged a copy of Grant's ABfW off eBay last week too! It should be arriving this week. Got a couple other classic titles in the lot. My word they look rather splendid. Those look terrific Millsy! Ev must be very pleased indeed. They look utterly splendid, thank you Mr Mills! But don't think for one moment that I'll go easy on you - the Spoonbill has been awakened, and you had best beware its wrath!